1. Try to be as clear as possible when making a request. Try NOT to be too elaborate - no artist will be able to be 100% on, and a huge list of details can be daunting. 2. Be polite when asking for a siggy/avi. Don't demand. Also please wait at least 2 days for a response before bumping the thread up again. 3. There will be rules for how long you have to wait on an artist, so don't pester a person who has offered to take time to make you something. 5. When an artist has made a graphic for you, you must host it to your own server. Bandwidths of the artist's hosting server can be exceeded and you can lose your graphic made for you. Also note: it is not the artist's responsibility if the graphic is lost! 6. When an artist finished a graphic for you, and you don't reply after at least 14 days + me (Eidolune) bumping the thread several times, I'll accordingly close your request thread! 7. Please solely request avatars and signatures on special occasions (e.g. GC's Festibration, Halloween etc.) in this thread! 8. Please understand that some artists are also fulfilling requests to practice and polish their graphics skills, and to be polite and understanding if the graphic isn't exactly what you were looking for. Everyone is doing their best! 1. When you say you will work on a request for a graphic, state whether others can try as well or not. If you fail to state a choice, then others are allowed to automatically. 2. Don't get offended if a requester doesn't "like" your style of sig/avi making. To each their own. 3. Once you post on a thread stating you will make a siggy/avatar, you have 3 days to finish it before another can take an attempt no matter whether you stated others could try or not. If you have an idea of how long it will take, try to post that in the thread asap. This section is solely for signature, avatar, bumper and roleplay banner requests that will be used on the Galaxy Cauldron Forums. All general graphics requests and off-site graphics requests should be made in this thread with the [Request] tag. While many people run graphics shops for fun, they also take time out to fulfill the random requests that happen in the Signature & Avatar Requests area! We want to reward that kindness! Those users who fulfill graphics requests in this section will receive the following points based on rank. But Jupiter, you ask, why aren't shopkeepers being rewarded for their hard work? Simple! Those shops are set up first and foremost for fun or for practice and some are more popular than others, making the ability to get points very skewed (a popular shopkeeper would get way more than a newbie!). When points are given just for requests, anyone can make a graphic and nab points, so it's fair! What if I make multiple signatures/avatars, etc. for a request? You will be rewarded based on the work put in. If each signature or avatar is substantially different, you will receive points. The awarding of these points is at the discretion of the section moderator, Eidolune. If there are any issues with the awarding of points regarding this, please feel free to PM Diana on the matter. We hope this will encourage you to pick up those random requests that do pop up in this area and that you will feel extra rewarded for your hard work (aside from the reward of making a requester happy, of course)! Important update! Please use the new [Open] and [Closed] tags on requests to indicate if you would like more graphics made. Thank you! Updated 4/14/16 - please R&U! 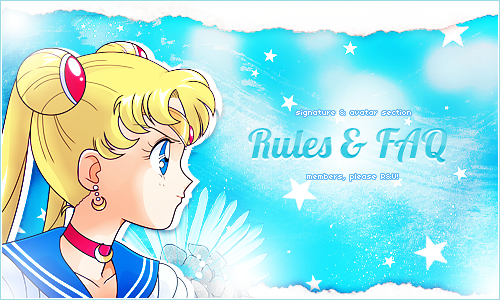 Update: Rules for Requests & Rules for Artists have been moved from the main sig/avi rules thread to this thread. 7. Please request avatars and signatures on special occasions (for example; GC's Festibration) in this thread! You don't have to R&U in this thread all the time. Nonetheless, remember to R&U the updates! thanks.